The Spanish Marine Infantry (Spanish: Infantería de Marina; lit, Naval infantry) is the marine corps of the Spanish Navy (Armada Española) responsible for conducting amphibious warfare by utilizing naval platforms and resources. The Marine Corps is fully integrated into the Armada's structure. The Corps was formed in 1537 by Charles I of Spain (also known as Charles V, Holy Roman Emperor), making it the oldest marine corps in existence in the world, drawing from the Compañías Viejas del Mar de Nápoles. The Spanish Marine Infantry is an elite corps, highly specialised in amphibious warfare, that is, to project an amphibious force onto a hostile, or potentially hostile, coast. Its ability to embark on a short term notice with (land, air and naval) Navy assets, makes it a unit with a high strategic value. Adding to this a high degree of training, and the capability to deploy swiftly in international waters, results in a potent dissuasive force available at a short notice in distant regions. One of the main characteristics of a marine is the uniform that he wears. 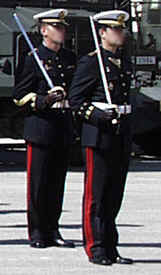 On the sleeves of the Spanish Marines are the three "Sardinetas", which marks it as a member of the Royal House Corps. This was given in recognition for a heroic last stand in the Castillo del Morro of Havana, Cuba against a British expedition in 1762. The only other unit to wear the sardinetas and red trouser stripes is the Spanish Royal Guard. Spanish Marines have modern assets to comply with its mission, having personnel specialised in artillery, sapping, helicopters, special operations, communications, tanks, among others. Some vehicles form the Grupo Mecanizado Anfibio del Tercio de Armada (the Mechanized Amphibious Group of the Navy Tercio). The Marines of Spain are not only a fleet force, as the Spanish Royal Marine Guard Company are responsible for the defense and security forces of naval bases and facilities, naval schools and training units, and all facilities that support the Marines themselves. The most famous Spanish Marine is without a doubt Miguel de Cervantes, author of the novel Don Quixote, who was wounded in the Battle of Lepanto in 1571. Another famous writer, Pedro Calderón de la Barca, also served with the marines. Tercio Nuevo de la Mar de Nápoles. Tercio de la Armada del Mar Océano. Tercio de Galeras de Sicilia. Tercio Viejo del Mar Océano y de Infantería Napolitana. 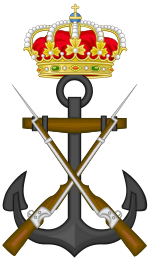 Of the Tercios above, the first is considered the core of the Spanish Marine Infantry, and it bears in its coat of arms two crossed anchors that became the Corps' coat of arms until 1931. In 1704, the Tercios became regiments: Regimiento de Bajeles (Vessel's Regiments), Regimiento de la Armada (Navy Regiment), R. del Mar de Nápoles (Naples' Sea Regiment), and R. de Marina de Sicilia (Sicily's Navy Regiment), detaching some small units to the Army, and the main body remained in the Navy becoming the Cuerpo de Batallones de Marina (Navy Battalions Corps). The conquest of Terceira Island (Azores) (1582). San Salvador (Brazil) expedition (1625). In 1717 the Cuerpo de Batallones de Marina was definitively settled and organized, reaching its full strength of twelve battalions. The first ones were named: Armada, Bajeles, Marina, Oceano, Mediterráneo and Barlovento. Their mission was to form the "Main body of landing columns and ship's soldiers tasks" in a time that boarding was still a critical part of battle at sea. They were also gun crews. In 1728 the battalion Mediterráneo and in 1731 the battalion Barlovento. In 1741 there were eight battalions and ten years later another was added. In 1740 a marine artillery corps was founded. At mid 18th century there were 12,000 marine infantry and 3,000 marine gunners. The infantry formed boarding parties while the gunners manned the ship cannons. As needed landing parties were formed. Both corps also garrisoned the navy's coastal fortresses. During the War of Spanish Independence both the marine infantry and the marine artillery was reorganized as seven regiments, mainly fighting on land as part of army divisions. In a 1793, a woman, Ana Maria de Soto, disguised as a man, and answering to the name of Antonio Maria de Soto, enlisted in the 6th company of 11° Battalion of the Navy, being licensed with pension and honors in 1798, when she was discovered to be a woman. She was the first female marine in the world. 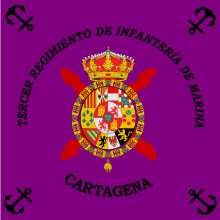 Color of 3rd Marine Regiment of Cartagena, today Tercio de Levante. The increasing efficiency of the naval artillery made boarding obsolete after the Napoleonic Wars, the marine infantry and marine artillery was merged in 1827 into a brigade, Brigada Real de Marina with focus on artillery. The brigade that consisted of two battalions was renamed the Real Cuerpo de Artillería de Marina in 1833. In the First Carlist War 1834-39, three battalions of marine infantry were organized, serving as field infantry. In 1839 the corps was renamed Cuerpo de Artillería and Infanteriá de Marina. In 1841 the infantry was transferred to the army. The marine artillery remained in the navy under the name of Cuerpo de Artillería de Marina . However, in 1848, the naval infantry was re-established by the formation of a new Corps, Cuerpo de Infantería de Marina, of three battalions. The marine artillery was abolished in 1857. The five battalions of marine infantry were reorganized in 1869 to three regiments, one for each naval station. By this time, the mission of the marines changed from naval garrison troops, to a landing force serving mainly in the colonies. During the Third Carlist War 1872–1876 the marines fought as field infantry. In 1879, the marine infantry academy, the Academia General Central de Infantería de Marina was founded. The colonial wars in the Philippines and on Cuba, with constant landing operations, lead to a reorganization of the marines into three brigades of two regiments each. In 1886 the marines contained four brigades, each with four tercios, while the reorganization of 1893 created three regiments of two battalions each. During the Philippine Revolution and the Spanish–American War the marines fought as part of army divisions. These actions were carried out by the Batallones Expedicionarios (Expeditionary Battalions), some of them campaigning abroad for up to ten years. At the end of the World War I, the Battle of Gallipoli made almost all countries abandon the idea of amphibious assault. The world's marine corps fell into a deep crisis, with the Spanish Marine Infantry being no exception, though it enjoyed success during the Third Rif War in its innovative Alhucemas amphibious assault in 1925, when it employed coordinated air and naval gunfire to support the assault. Owing to its high-profile action in the unpopular Rif Wars, the Spanish Navy Marine corps was branded as a leftover of the Spanish colonial era. After the proclamation of the Second Spanish Republic in 1931, the reforms of the armed forces introduced by newly nominated Republican Minister of War Manuel Azaña within the first months of the new government sought to disband the corps. Before it was officially disbanded, however, the Spanish Civil War intervened and the corps split and served both sides with the garrisons of Ferrol and Cádiz on the Nationalist side and the garrison of Cartagena, as well as a detachment in Madrid, on the Republican side. During the bitterly fought war the Marines performed garrison duties, led landing parties, and provided expert artillery and machine gun crews. The Republican 151 Brigada Mixta fought mostly inland battles far away from the sea. Photographer Robert Capa took pictures of the Spanish Spanish Marine Infantry in the Battle of the Segre. Republican Infantería de Marina Lieutenant Colonel Ambrosio Ristori de la Cuadra, killed in action during the Siege of Madrid, was posthumously awarded the Laureate Plate of Madrid. After the civil war, during the dictatorship of Francisco Franco, the strength of the Infantería Marina was increased. In 1957, the Grupo Especial Anfibio (Amphibious Special Group) was created, and the Spanish Marine Infantry returned to its primary duty as a Landing Force Mission. In 1958 it established a beachhead in Spanish Sahara and Ifni during the Ifni War. The capabilities and strength of the Spanish Marine Infantry were increased: new amphibious vehicles, anti-tank weapons, individual equipment and artillery. The Tercio de Armada (TEAR) became the main amphibious unit and has experienced several restructures that led to the E-01 Plan, which defines the requirements and structures from the year 2000 for the Spanish Marine Infantry. The Spanish Marines have been present in Europe, Central America and Asia in an anonymous role as an "emergency force" ready to evacuate civilians in conflict areas, or as a deterrence force in providing cover for the actions of allied forces. The current base for the Spanish Marines is in San Fernando. The Spanish Marine Infantry have been deployed to various NATO operations such as Afghanistan. Since the 2009, the special operations units from the Spanish Navy (the Special Combat Divers Unit (UEBC), the Special Explosive Defusers Unit (UEDE) from the Navy Diving Center, and the Special Operations Unit (UOE) from the Marine Infantry) are merged into the Special Naval Warfare Force, that is organized inside the Marines. This unit has also taken part in several operations including Atalanta in Somalia, United Nations Interim Force in Lebanon, Hispaniola in Haiti and the hijack of the fishing vessel Alakrana in Somali waters. Even though the ranks of the Marine Infantry are similar to Spanish Army ranks they wear also sleeve and cuff insignia to recognize them as part of the naval establishment, aside from shoulder rank insignia. 10º mandamiento : ¡Mi lema! … ¡Valiente por tierra y por mar! 1: As a Marine my first duty is to be constantly ready to defend Spain and give my life if necessary. 2: I shall be always loyal with my brothers, respectful with my superiors, generous and devoted to my task. 3: I shall be always ready to face with courage, dedication and spirit of service any mission assigned to the Spanish Marine Corps. 4: I shall be always respectful about the traditions of the Corps, be proud of its history and will never do anything that may adversely reflect on its name. 5: I shall guide my conduct with respect for people, their dignity and rights I shall guard. 6: As a Marine, discipline will be my standard of acting in all tasks assigned to me. 7: As a Marine, my mission is sacred in its fulfillment, I shall either win or die. 8: Improving my body and training my mind shall be my permanent goals. 9: I shall be strong on fatigue, brave in battle, discouragement shall never nest in my heart, for honor and courage are my banners. 10: My motto! : Bravery in land and in the sea! Spanish marines assigned to the frigate SPS Numancia (F83). Spanish Marine Infantry deploying from an AAV-7 during an exhibition on Sardinero beach in Santander, in celebration of Armed Forces Day (Dia de las Fuerzas Armadas) in 2009. An M109 howitzer of the Spanish Marines coming ashore during Exercise BRIGHT STAR 01/02, in 2001. Miguel de Cervantes Spain's most famous Marine, injured at the Battle of Lepanto (1571), where the Spanish marines played a decisive part. ^ a b c d e f g h i j k La Infantería de Marina Espanola. Sintesis histórica y Evolución Orgánica. Ministerio de Defensa, 2011. ^ Enrique Martínez Ruiz & al. Spain and Sweden: encounters throughout history. Madrid 2001, s. 86. ^ "1717 – 1740. Batallones de Marina." Los Ejércitos del Rey. Archived 4 February 2018 at the Wayback Machine 2018-06-28. ^ Colección de las leyes, Decretos y de Decaciones de La Cortes, y los Reales Decretos de 1841. Madrid 1842, p. 884. ^ "Robert Capa picture of the 151 Brigada Mixta at the Battle of the Segre". Archived from the original on 9 December 2012. Retrieved 29 July 2012. ^ "Diario Oficial de la República, nº 47 (16 February 1938)" (PDF). Archived (PDF) from the original on 1 November 2013. Retrieved 1 August 2012. ^ "The Spanish Marine Corps concludes advising tasks for the National Afghan Army". Archived from the original on 17 September 2018. Retrieved 17 September 2018. ^ "¿CUÁLES SON LAS PRINCIPALES OPERACIONES Y EJERCICIOS EN LOS QUE HEMOS PARTICIPADO? - Fuerza de Guerra Naval Especial (FGNE)". armada.mde.es. Archived from the original on 28 August 2018. Retrieved 10 October 2018. ^ "La Profecíon Militar." Fuerzas Armadas Españolas. Archived 27 January 2018 at the Wayback Machine 2018-07-29. ^ "Presentación Empleo y Formación." Armada Española. Archived 30 July 2018 at the Wayback Machine 2018-07-29. ^ Maíz Sanz, Julio (17 October 2018). "La Fuerza de Guerra Naval Especial de la Armada se dota con fusiles de asalto HK416". Defensa.com. Archived from the original on 9 November 2018. Retrieved 10 November 2018. ^ "Spanish Navy – Defense Department – Spain Government – Armada Española". Armada.mde.es. Archived from the original on 11 January 2011. Retrieved 18 May 2012. Wikimedia Commons has media related to Spanish Navy Marines.